The Auk: Ornithological Advances aims to advance fundamental scientific knowledge by increasing the basic knowledge of bird species and the knowledge of biological concepts through studies of bird species. A movement is growing where science is no longer restricted to academics but instead it has become a pursuit for the public in general. Nature lovers have unwittingly been acting as data collectors, especially people that create lists of wildlife they see at home, in the park, or during a hike. Birdwatchers are known for making lists of the bird species they see, and scientists have come to realise that these lists can provide extremely useful information for monitoring animal populations. Through initiatives like eBird or the European Bird Portal, checklists are now being used to monitor bird population trends and track migrations. This contribution of the general public to scientific research is called Citizen Science. Citizen science has been around for a long time; for instance, the Christmas Bird Count in North America first began in 1900. The Christmas Bird Count involves volunteers that conduct organised counts of bird species, within circles of 24km diameter, between 14 December and 5 January each year. This provides important information about bird trends across North America. Today, a number of similar coordinated initiatives aim to stimulate citizen science such as nationwide counts on a specific weekend of garden birds in the United Kingdom, The Netherlands, France, and Germany. An even larger initiative invites citizens across the globe to observe as many birds as possible in a single day. On 5 May 2018, some 30,443 participants reported 7,025 species to eBird. There are numerous other ways to get involved in citizen science, such as the long running Serengeti Snapshot project where volunteers classify millions of photos collected through camera traps. Citizen science projects have also been designed to include schools and advance environmental education. Reaching out to such wide audiences can prove challenging; societies and conservation organisations can provide an important link between researchers and citizen scientists. 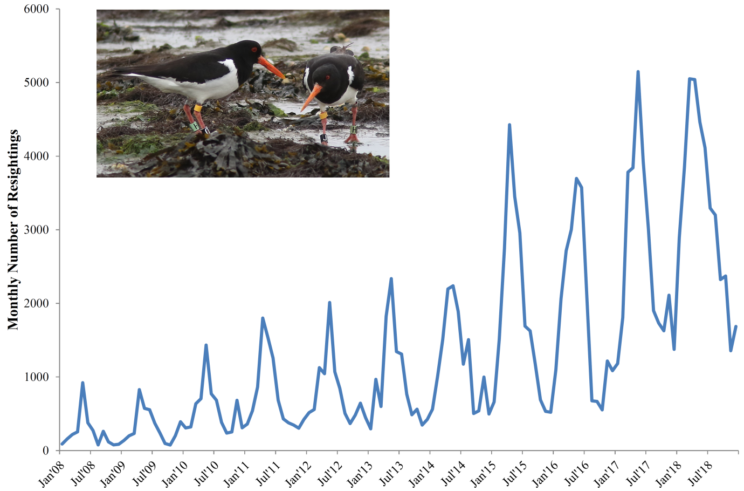 The growth for the number of observations of colour-ringed oystercatchers over time. Inset image is a pair of colour-ringed oystercatchers on the island of Ameland by Tom Voortman. Used with permission. Citizen science data does create a number of challenges when used in academic research. Citizen science data collection can make it difficult to compare data across years or between different areas. If we return to the Christmas Bird Count, 27 birders took part in the first count in 1900 and observed approximately 90 species. In contrast, over 65,000 participants took part in the 2017-18 Christmas Bird Count. Citizen scientists saw 379 species in Texas alone. It’s important for researchers to control for the largely unstandardized form of data collection. Without addressing factors like the number of people participating, the experience of volunteers, the hours spent in the field, or the distance travelled, it may appear that we have more biodiversity in our cities than in remote natural areas, simply because there are more people in cities reporting what they see. Despite the challenges of citizen science data, researchers are able to make important insights from the data. Our recent study showed how citizen scientists were vital for identifying the migration patterns of Eurasian Oystercatchers, a bird we’re studying to estimate seasonal survival rates across different regions. The NGOs of Sovon Dutch Centre for Field Ornithology and Birdlife Netherlands launched the citizen science project in 2008. One specific goal was to increase the number of areas where oystercatchers were fitted with colour rings. Oystercatchers with colour rings become uniquely identifiable, allowing researchers to track the birds’ movements and estimate how long they survive. Colour-ringing already occurred on a few specific coastal locations, but the project needed to include birds from other coastal areas and inland areas. Citizen scientists were necessary to covering such large areas. Through a series of outreach events, researchers established 16 new study areas in 2008 where citizen scientists received the necessary training to capture and equip breeding oystercatchers with colour-rings. The project is now into its eleventh year. It has over 40 active ringing groups who have ringed more than 15,000 oystercatchers. Citizen scientists have entered nearly 212,000 observations of these colour-ringed birds. This provides important information about the cumulative human impact on bird populations. There are an increasing number of opportunities to participate in citizen science, especially with the advent of the internet and, more recently, smartphones. An additional benefit of citizen science is that it strengthens people’s connection with nature, which is important in an ever urbanising world in which we face many environmental challenges. We should also be considering how to develop citizen science projects in schools to enhance children’s connection with nature at a young age. Featured image credit: Spot the colour-ringed oystercatchers (five in focus, with two more blurred in background) by Tom Voortman. Used with permission. 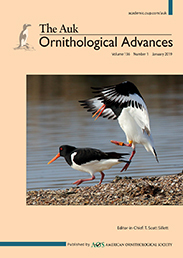 Andrew M. Allen is the corresponding author for the article "Seasonal survival and migratory connectivity of the Eurasian Oystercatcher revealed by citizen science," recently published in The Auk: Ornithological Advances. Dr. Allen is associated with Radboud University, Department of Animal Ecology and Physiology, Nijmegen, The NetherlandsCentre for Avian Population Studies, The Netherlands.